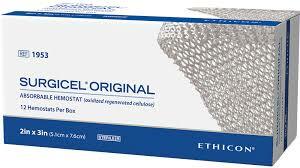 Surgicel is an absorbable oxidized regenrated cellulose hemostatst wound filler for meeting the demands of dental surgery. The first and only absorbable hemostats proven bactericidal against a broad range of gram-positive and gram-negative organisms including various antibiotic-resistant bacteria (MRSA, VRE, PRSP and MRSE). Proprietary oxidized regenerated cellulose (ORC) technology designed to ensure purity and consistency. Flexible and malleable, can be cut to size. It can be used in extraction sites & biopsy sites. Medicine will be delivered based on prescription only.